A week or so ago- I was reading 1+1+1=1. She recently posted these story book props for some Christmas books (it's a free download like ALL of her stuff is!). I thought this was a great idea, but didn't have the books. So a few days later- I broke down and bought them because I wanted to we only have a few Christmas books....and I have never gone wrong getting anything that she recommends. Also- the books were reasonably priced! I printed out the story book props before I got the books because I wanted to be prepared with Christmas coming so soon. Carisa prints them out on card stock, cuts out the images, and places magnets on the back....then uses a cookie sheet. This is a great idea. So I just cut out and hot glued the felt to the foam board making my own cheap and easy felt board. Felt is a pretty reasonable price, plus- use a 40% off coupon from online or mailers to Joann's or Hobby Lobby. I then laminated the story pieces and then hot glued felt to the back of those. The girls received the book for their advent 'gift' yesterday. We sat down in the living room to read by the board. Parker had not seen the storyboard pieces that I had cut out yet, and so she was surprised and excited when I started placing things on the board. I didn't get any pictures of our actual 'story time'. But when we were done....she asked if she could 'read' it by herself. And she did for a bit....placing the pieces on the board and reading to her 'class'. Other than the fun we had....this was a GREAT learning tool for Parker for beginning sounds. After we would put the picture up....I placed the word underneath. She was very interested in 'reading' those words...and we talked about the beginning sounds and she was able to pick the right words later when doing it by herself by sounding out the first letter. This is something that I have tried to talk to her about before, but she quickly becomes disinterested. So for now....it seems as though this is something that is making her excited about 'reading' and makes me excited in return. Seriously- I cannot say enough good things about these story prop printables! These pictures pick up after we are done and she is 'reading' by herself. 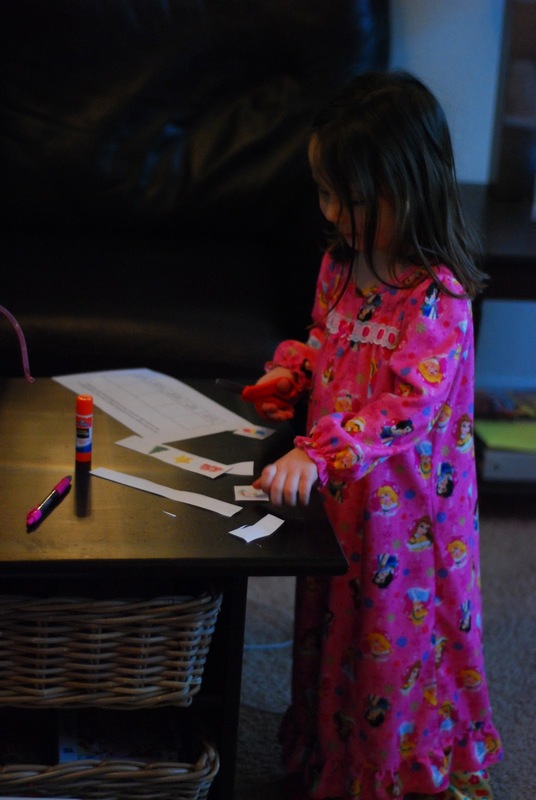 Along with the story prop printables....she also includes this cut and and paste activity that Parker did by herself. And then ran to the board to show how she had done it right. We got 2 more books in the mail yesterday and I am excited to get those story props mounted to felt for more story times in the next few days. Amazing how smart she is! She (they) are so smart because y'all take the time with them to do these projects too!